A prolific writer of chart-performing songs, Paich wrote or co-wrote such tracks as "Hold the Line", "99", "Lowdown", "Lido Shuffle", "Georgy Porgy", "Rosanna", "Hydra", "Holyanna", "Pamela", "Got To Be Real", and "Lady Love Me (One More Time)", and "Miss Sun". He also performed lead vocals on the Toto hits "Africa", "Lovers in the Night", and "Stranger in Town". Paich remained with Toto from the beginning of the band in 1977 to 2004 and performed on only a few shows until their disbandment in 2008. Session keyboardist Greg Phillinganes joined Toto in 2003 as an additional keyboardist for both studio projects and tour dates. 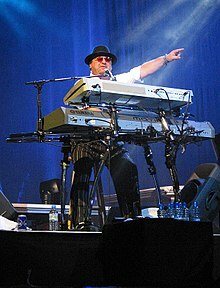 In 2010, Paich resumed performing with Toto, and is the current keyboard player alongside other original member Steve Porcaro. With Toto in between legs of its 2018 40 Trips Around the Sun (40th anniversary) tour, the band announced via its official website on July 20, 2018 that Paich "will not be performing on the band’s planned North American tour [lasting from July 30-November 17]. The recent European appearances [February 11-April 8] took a toll on his personal well-being... He plans on focusing on his health, and looks forward to returning to the road when ready to do so." He has co-writing credits with Boz Scaggs on the songs "What Can I Say", "Lowdown", and "Lido Shuffle" from the multi-platinum album Silk Degrees, and occasionally still sits in on keyboards with Boz Scaggs' band. As songwriter he wrote or co-wrote songs for Cher, The Jacksons, Andy Williams, George Benson, Glen Campbell, Boz Scaggs, Jon Anderson (Yes), Cherie & Marie Currie, and Chicago. As arranger he worked for Michael Jackson, Rod Stewart, Patti Austin, Donna Summer, the Doobie Brothers and many more. In 1977, Paich produced the No. 1 R&B hit "Break It to Me Gently" by Aretha Franklin. In the early and mid '80s, Paich often worked with well-known producers Quincy Jones and David Foster. Paich was a part of the session group on the Michael Jackson album Thriller. He played piano, synthesizer, and did some synth and rhythm arrangements. In 1982, Paich produced and arranged song "It's A Long Road", for the film First Blood. In 1989, Paich produced and arranged the Oscar-nominated song "The Girl Who Used to Be Me", written by Marvin Hamlisch and Alan & Marilyn Bergman, for the film Shirley Valentine and produced song "I'll Be Holding On", written by Hans Zimmer and Will Jennings, for the film Black Rain. As a session musician Paich has played on numerous soundtracks and on albums by many artists, including Elkie Brooks' album Rich Man's Woman; Bryan Adams' song "Please Forgive Me"; Michael Jackson songs "Earth Song", "The Girl Is Mine", "Heal the World", "Stranger in Moscow", and "I Just Can't Stop Loving You"; and the USA for Africa song "We Are the World", as well as work with Aretha Franklin, Boz Scaggs, Quincy Jones, Melanie Safka, Don Henley, Diana Ross, the Doobie Brothers, Neil Diamond, Seals and Crofts, Steely Dan, Elton John, Joe Cocker, Rod Stewart, Cher, Randy Newman, the Brothers Johnson and Pink. David Paich traveled to China where he worked composing theme music for the 2008 Summer Olympics. In 2009, he sang the hit song "Africa" at the Millennium Development Goals awards in New York and co-produced a new tune for George Benson. Paich was involved with the 61st Primetime Emmy Awards as a music producer and keyboardist for the on-stage band. 1974 – Emmy Award for Best Song or Theme: David Paich & Marty Paich (songwriters) – "Light The Way", from the Ironside episode "Once More For Joey"
^ "David Paich of Toto". ^ "Cher - Prisoner". Discogs. ^ "Prisoner - Cher - Songs, Reviews, Credits - AllMusic". AllMusic. ^ "Victory - The Jacksons - Songs, Reviews, Credits - AllMusic". AllMusic. ^ "Andy & David - The Williams Brothers - Songs, Reviews, Credits - AllMusic". AllMusic. ^ "In Your Eyes - George Benson - Songs, Reviews, Credits - AllMusic". AllMusic. ^ "Houston (I'm Comin' to See You) - Glen Campbell - Songs, Reviews, Credits - AllMusic". AllMusic. ^ "Hits! - Boz Scaggs - Songs, Reviews, Credits - AllMusic". AllMusic. ^ "In the City of Angels - Jon Anderson - Songs, Reviews, Credits - AllMusic". AllMusic. ^ "Cherie And Marie Currie* - Messin' With The Boys". Discogs. ^ "Messin' with the Boys - Cherie & Marie Currie - Songs, Reviews, Credits - AllMusic". AllMusic. ^ "Chicago 16 - Chicago - Songs, Reviews, Credits - AllMusic". AllMusic. Bolden, Juliana J. (September 18, 2009). "Pop-rock giants Steve Jordan, David Paich strike up one hot band". Emmys.com. Retrieved October 30, 2009. "Equipment Dave". Toto99.com. Archived from the original on November 15, 2013. Retrieved February 12, 2012. Eskow, Gary (July 14, 2006). "How David Paich Recorded Toto's Latest Album". MixOnline.com. Archived from the original on April 6, 2009. Retrieved October 30, 2009. O'Neil, Thomas (1993). The Grammys For the Record.